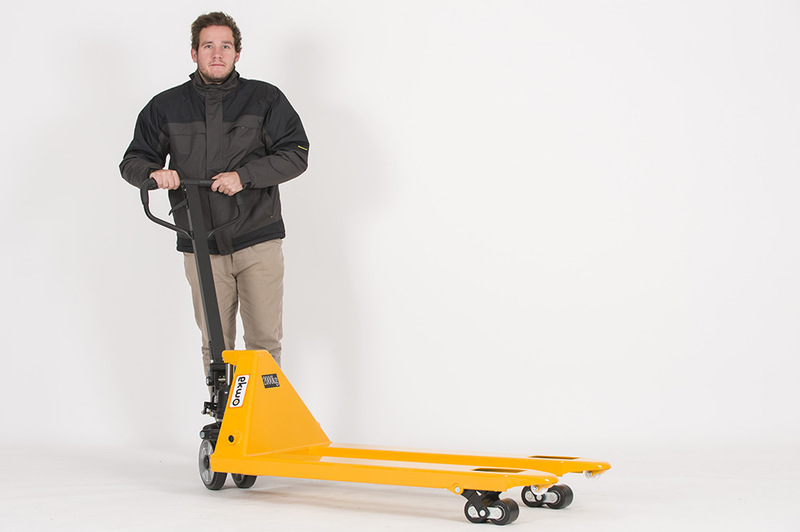 Pallet trucks are used to transport goods across short distances quickly, easily and safely – providing the correct procedures are followed. Pallet trucks look simple enough, however, if not operated correctly they can cause serious injuries – don’t make the mistake of assuming that a small pallet truck is harmless. On-site training is advised to learn how to use them safely. To help you get up to speed on some of the essentials of pallet truck safety, we’ve put together the following advice. Follow the steps below and your pallets will be transported quickly, efficiently and safely, giving you time to be getting on with other important jobs – or lunch! Boots with steel toecaps are required for the transportation of pallets using pallet trucks. Why? This is because your toes could get hurt or damaged if you were to accidentally steer a loaded pallet truck into yourself and hit your feet. If this happens to you, you’ll quickly learn that steel toecaps are the way forward! We have a range of safety shoes perfect for the job. We also recommend that you wear a hi vis jacket at all times whilst undertaking this activity; that way your colleagues will be able to see you coming a long way away and avoid being on the receiving end of a crash. Our hi vis clothing can be found here. A hard hat is also advised as items can unexpectedly fall from racking or from the pallets themselves. Not to mention trips and falls can also result in head injuries. A range of protective headwear can be found on our website. Check the lever, handle and wheels and ensure that they look to be in perfect working order. If there are any obvious cracks or signs of damage report it to your line manager. Do not use the equipment if you feel it is not in perfect working order. Keep a safe distance between your body and the tow bar; catching yourself by being too close to the forks will hurt. We do not recommend that you find this out the hard way! Once the pallet is safely on the pallet truck and there is enough space between the floor and the pallet truck, you are ready to go. Keep an eye out for your colleagues and try to be considerate of the safety of those around you by not making any sudden sharp turns. We hope you have found these tips useful. We are a well-known supplier of industrial equipment such as pallet trucks. For more information about our range click here. Please keep checking back to this blog for more useful tips.